Echocardiography is increasingly used in the management of the critically ill patient as a non-invasive diagnostic and monitoring tool. Whilst in few countries specialized national training schemes for intensive care unit (ICU) echocardiography have been developed, specific guidelines for ICU physicians wishing to incorporate echocardiography into their clinical practice are lacking. Further, existing echocardiography accreditation does not reflect the requirements of the ICU practitioner. The WINFOCUS (World Interactive Network Focused On Critical UltraSound) ECHO-ICU Group drew up a document aimed at providing guidance to individual physicians, trainers and the relevant societies of the requirements for the development of skills in echocardiography in the ICU setting. The document is based on recommendations published by the Royal College of Radiologists, British Society of Echocardiography, European Association of Echocardiography and American Society of Echocardiography, together with international input from established practitioners of ICU echocardiography. The recommendations contained in this document are concerned with theoretical basis of ultrasonography, the practical aspects of building an ICU-based echocardiography service as well as the key components of standard adult TTE and TEE studies to be performed on the ICU. Specific issues regarding echocardiography in different ICU clinical scenarios are then described. Obtaining competence in ICU echocardiography may be achieved in different ways – either through completion of an appropriate fellowship/training scheme, or, where not available, via a staged approach designed to train the practitioner to a level at which they can achieve accreditation. Here, peri-resuscitation focused echocardiography represents the entry level – obtainable through established courses followed by mentored practice. Next, a competence-based modular training programme is proposed: theoretical elements delivered through blended-learning and practical elements acquired in parallel through proctored practice. These all linked with existing national/international echocardiography courses. When completed, it is anticipated that the practitioner will have performed the prerequisite number of studies, and achieved the competency to undertake accreditation (leading to Level 2 competence) via a recognized National or European examination and provide the appropriate required evidence of competency (logbook). Thus, even where appropriate fellowships are not available, with support from the relevant echocardiography bodies, training and subsequently accreditation in ICU echocardiography becomes achievable within the existing framework of current critical care and cardiological practice, and is adaptable to each countrie's needs. The application of echocardiography in the critically ill has been well-recognized for several years, principally in patients following cardiac surgery [1–6]. The use of this technique is presently expanding to include diagnosis and monitoring on the general intensive care unit (ICU) [7–14]. Further, as echocardiography is an evolving technology with broadening applications throughout medical and surgical practice, and equipment is becoming cheaper, more portable and more widely available [15–19], it is inevitable and appropriate that medical practitioners other than cardiologists and echocardiographers should seek to develop skills in the performance of ICU echocardiography. Currently there are no specific guidelines for ICU physicians wishing to incorporate echocardiography into their clinical practice. Despite this, many are recommending that echocardiography should be incorporated into ICU training programs due to its ability to positively impact on patient management [20–35]. However, due to the complexity of issues involved, few have developed specialized national training schemes for ICU echocardiography [28, 36, 37] and echocardiography accreditation (through EAE, BSE or the ASE) does not reflect the requirements of the ICU practitioner, as they contain heavy emphasis on valvular disease, little haemodynamic monitoring, and an absence of pathology in the critically ill. The World Interactive Network Focused on Critical UltraSound (WINFOCUS, http://www.winfocus.org) is a scientific society committed to the development of high-quality ultrasound in the emergency and ICU setting, including echocardiography. This document has been prepared from recommendations published by the Royal College of Radiologists , and British Society of echocardiography , European Association of Echocardiography  and American Society of Echocardiography , together with input from established practitioners of ICU echocardiography to provide guidance to individual physicians (and also to inform program directors, the relevant echocardiographic and intensive care societies, hospital administrators and health care policy makers) of the requirements involved in the development of skills in echocardiography in the ICU setting. Although the authors recognise that ICU clinicians may use ultrasound to image other organ systems, for the purposes of clarity these recommendations are limited to training and accreditation in echocardiography. Recommendations for training of non-radiologists in the imaging of other organ systems exist [38, 41], and WINFOCUS projects already include systematic development of a comprehensive ultrasound curriculum for the intensivist and critical care physician [23, 42]. Point-of care echocardiography has become an indispensable tool in the management of the critically ill patient, providing rapid assessment of cardiac function and physiology that complements data available from standard invasive hemodynamic monitoring [8–12, 28]. This expanding use of echocardiography may also have been driven by recent publications that have raised concerns regarding pulmonary artery catheterisation [43–48]. Further, the technological advances leading to progressive miniaturization of systems, and advances in echocardiographic techniques (including harmonic imaging, digital acquisition and contrast-enhanced endocardial definition) together with the development of more portable echocardiographic systems has led to their increased use in the ICU. Here, echocardiography is uniquely useful in providing both a monitoring and diagnostic tool for rapid bedside assessment of cardiovascular pathophysiology in the critically ill [12, 30, 49]. In contrast to standard diagnostic studies, frequently answers to specific questions are required (e.g. loading and volume responsiveness, cardiac output, ventricular function) rather than a fully comprehensive study. Despite enthusiasm for its use by specialists, there is little data to prove the benefit of echocardiography on the ICU. A number of studies have, however, indicated its potential usefulness in changing the diagnosis and management of the critically ill [29–35], together with assessment of ventricular function [10, 50–53] fluid responsiveness  and the hemodynamics of shock states [8, 9, 12, 55, 56]. In addition to standard echocardiography skills, an ICU echocardiographer must be able to interpret findings from both trans-thoracic and trans-esophageal studies, to expeditiously answer specific questions in the context of the rapidly changing pathophysiological status of the critically ill patient, and be accessible for continued echocardiographic monitoring. This, in addition to having the necessary experience to recognize the need for a more detailed study and referral to a more experienced practitioner. Thus, a training and accreditation process targeted at ICU echocardiography must encompass a practice that differs from regular echocardiography, and presents a real challenge. Furthermore, it is essential that ICU echocardiography is incorporated into a co-ordinated echocardiography service, and requires continued communication with cardiologists, echocardiographers and departments of echocardiography. Competence in echocardiography and other ultrasound techniques is generally separated into three distinct levels[23, 38, 57–59] (Figure 1). Although emergency echocardiography is currently being considered as a potential core skill for the acute physician, this covers a limited differential diagnosis, and does not equate to Level I training [30, 60, 61]. Whilst for emergency physicians this level of competence (peri-resuscitation focused echocardiography) may be regarded as adequate, the practicing ICU physician trained in echocardiography will require competencies beyond this. In order to achieve this, a degree of flexibility, reflecting the practice and time-constraints of the ICU physician, will be required, when compared to achieving an equivalent standard for cardiologists. Proposed Levels of competence of echocardiography in ICU. According to the widely accepted concept of levels of competence in echocardiography and ultrasound practice (modified from ), a 3 Levels structure is proposed. Note that Emergency Echo just represents an entry level, a first very basic step in Echo competence, and does not equate Level 1. TTE = TransThorachic Echocardiography; TEE = TransEsophageal Echocardiography; ALS = Advanced Life Support; FEEL = Focused Echocardiographic Evaluation in Life support; FATE = Focused Assessment with Transthoracic Echocardiography. The Level 1 practitioner is thus not "accredited" in echocardiography, but rather has achieved competency in performing high quality echocardiographic examinations specifically targeted to the ICU patient population (for example, peri-resuscitation echocardiography), with clear knowledge of their limitations and requirement for referral where abnormalities are found. This level of practice is commonplace in the ICU, and is analogous to interpretation of chest radiography or electrocardiography; here, where an abnormality is seen but the diagnosis not obvious, the practitioner routinely seeks more expert advice. While training programs vary internationally, this level of competence may be gained during conventional postgraduate specialist training programs in ICU. Alternatively, where such training is not available as part of a critical care fellowship it may be acquired during a specialized training course followed by guided practical experience in the ICU. This supervised practical experience could be combined with on-line learning (blended learning) to provide a structure to the training programme. The training required for this level of practice would usually be gained during a period of subspecialty training which may either be within or after the completion of a specialist ICU training program, and would require interpretation of both TTE and TEE. This would equate to the level of training in radiology (or echocardiography for an imaging cardiologist) at the time of completion of specialist training, or echocardiography accreditation (i.e. BSE/ASE/EuroEcho). This would equate to a consultant cardiologist/intensivist with a subspecialty practice which includes a significant commitment to echocardiography in the ICU. The boundaries between these three levels are difficult to define precisely, and the above are a guide to different levels of competence and experience. In the detailed syllabus attached to this document in Appendix 4 an attempt is made to indicate more specifically the type of experience required for each level of training. Despite echocardiography having historically been exclusively the domain of the cardiologist, with the development of TEE and its use in the cardiac surgical setting, its use has extended to anaesthetists. Indeed, in the UK > 90% of TEE studies are now undertaken by anaesthetists. This extension of echocardiography beyond the specialty of cardiology is likely to continue. Focused echocardiography as an adjunct in the peri-arrest period is likely to become a core competency for acute medicine trainees , and with the increasing recognition of the potential role of echocardiography on the ICU, international training recommendations now include basic echocardiography . Whether this should extend to intensivists becoming fully trained and accredited in echocardiography remains, for some, contentious. Although specialist training in cardiology will generally include TTE to level 2 equivalence (or accreditation), cardiology training programmes often excludes formal exposure to general ICU. Further, the specific conditions most relevant to the ICU (i.e. sepsis, filling status, ventricular function related to the level of inotropic support, heart-lung interactions in mechanically ventilated patients) are not generally addressed, and the use of echocardiography as a monitoring tool is not taught. In addition, the diagnosis of pathology in the ICU is on occasion better resolved with TEE rather than TTE. Finally, ready availability of appropriately trained consultant cardiologist-echocardiographers for the repeated examinations required in the ICU is not always possible. By contrast, the practicing intensivist has a wide knowledge of the pathophysiology of the critically ill, and is readily available, but may not have the necessary echocardiographic skills. When such intensivists have been appropriately trained to perform TTE, TEE and physiological echocardiography, they will be ideally positioned to perform ICU echocardiography. Development of an appropriate program will require extensive cooperation and support form a hospital's cardiology service. This support extends beyond initial training to include support for quality assurance, maintenance of competency among the ICU practitioners and most importantly backup in the case of a difficult diagnosis or one beyond the daily scope of practice of the ICU echocardiographer. An example of such a diagnosis could be evaluation of a mitral valve for suitability for repair. These recommendations are concerned with theoretical basis of ultrasonography, the practical aspects of building an ICU-based echocardiography service as well as the key components of standard adult TTE and TEE studies to be performed on the ICU . These recommendations are summarized in Appendices 1 through 3. The intended benefits of these recommendations are to support the development of local protocols and quality control programs for echocardiography on the ICU, promote quality by defining a minimum dataset of descriptive terms and measurements, and a systematic approach to constructing a report, to facilitate the accurate comparison of serial echocardiograms performed in ICU patients. These recommendations are in line with recommendations from the European Association of Echocardiography [63, 64] and the British Society of Echocardiography . Without a solid understanding of the physical basis of ultrasonography the practitioner will not be able to perform and interpret an exam accurately. Thus, any programme should include training in the appropriate selection of ultrasound modality and in the mechanics of setting up and running an intensive care echocardiography service. A syllabus for theoretical training is presented in Appendix 1. Recommendations for the minimum image and analysis dataset comprising a standard, comprehensive adult TTE are shown in Appendix 2. Although there is broad agreement over what views and recordings are essential in any comprehensive study , in contrast to standard, out-patient diagnostic echocardiography however, focused studies may be appropriate (i.e. to exclude pericardial collection, or to monitor pulmonary arterial pressures in response to therapeutic intervention). These should be identified as being focused studies, and are not covered by these minimum standards, although relevant parts of the recommendations can be utilized. When the condition or acoustic windows of the patient prevent the acquisition of one or more components of the Minimum Dataset, or when measurements result in misleading information (e.g. off-axis measurements) this should be stated. Recommendations for the minimum image and analysis dataset comprising a standard, comprehensive adult TEE are shown in Appendix 3. Althought there is broad agreement over what views and recordings are essential in any comprehensive study [4, 40], however, as with TTE, on the ICU focused studies may be appropriate on occasion and these should be clearly identified as such. The specific details regarding echocardiography for each of these clinical scenarios are addressed in Appendix 5. Accrediting authorities in echocardiography are not generally proscriptive in how the trainee achieves the standard required for accreditation, but rather in setting the standard [BSE, EAE, ASE]. Education of cardiologists in echocardiography is generally achieved as part of a standard training scheme with supervised, hands-on experience combined with attendance at existing national and international courses. Similarly, cardiothoracic anaesthetists wishing to become accredited in TEE will generally spend time in a cardiothoracic centre undertaking a specific fellowship, together with attendance at appropriate courses – some directed specifically towards examination preparation . The main challenge for trainees and existing consultant intensivists is how to achieve training and accreditation in ICU echocardiography when specific fellowships and/or diplomas are not available. Time limitations and lack of access to training in the ICU generally causes an issue for intensivists – together with lack of expertise in this rapidly expanding field. Hence, this document seeks to suggest ways in which this training may be achieved, whilst maintaing the standards of accreditation required by the echocardiography societies. Training in echocardiography encompasses both theoretical and practical elements. Theoretical background is prerequisite for the performance and interpretation of an echocardiographic exam  (Accessed August 2008). The required elements of theoretical training are outlined in Appendix 1. This element of training may be best delivered by linking with courses run by university departments accredited by the Consortium for the Accreditation of Sonographic Education (CASE) – or other basic ultrasound/echo courses. A syllabus for ICU echocardiography structured into three levels of training is proposed, incorporating theoretical training on anatomy and pathology and a practical syllabus listing conditions which should be included in the experience of the trainee. The levels and potential modes of training are shown in Appendix 4. Practical experience should be gained under the guidance of a named supervisor trained in echocardiography within a department. This would normally be a department of echocardiography and/or in the ICU, however, there may be some areas of echocardiographic practice which are may be better covered in other departments, such as intra-operative echocardiography for TEE. Accreditation in ICU echocardiography should be under the auspices of the appropriate regulatory national and international bodies, and must not represent a substandard or simplified accreditation. Indeed, many would argue that due to the rapidly changing pathophysiology of the critically ill patient, ICU accreditation (with its requirement for both TTE and TEE, together with in depth haemodynamic assessment) should be regarded an upgrade or extension of existing accreditation. In practice, the most appropriate process would be for the existing accrediting authorities (ASE, BSE, EAE) to modify existing examination and logbook content to reflect the clincal situation and casemix of the critically ill. Indeed, similar collaboration between ACTA and the EAE, and ACT and the BSE resulted in TEE accreditation being widely available. • Accreditation is a minimum standard and cannot be regarded as a guarantee of continuing competence. Successful candidates will be expected to begin a process of continuing medical education towards re-accreditation (minimum of 50 studies per annum, ideally in excess of 100). • The re-accreditation process will include evidence of continuing clinical activity, distance learning and attendance at courses and conferences. The log-book will be collected over a period of up to 24 months, as part of a recognised ICU echocardiography accreditation programme (i.e. BSE). Where appropriate, studies performed during Level 1 training may be used. In order to allow flexibility for applicants without access to both modalities of echocardiography, accreditation will be based on interpretation of TTE and TEE (examination) however, the logbook may contain studies of either TTE, TEE or TTE & TEE, depending on the practice of the applicant. In addition, where the applicant already holds current accreditation in either TEE or TTE, the number of required studies will be reduced accordingly (Table 1). Number of cases required for logbook depending upon accreditation already held by applicant. • All reports submitted must carry the signature of the candidate. • Where intra-operative TEE studies are performed before and after bypass during the same operation, these count as one study. A study performed for the same patient on another occasion counts as a separate study. • A letter from the supervisor must be submitted with the completed log-book certifying that the studies have been recorded by the candidate. ICU echocardiography should be set up as part of the hospital's comprehensive service. Thus, standards of an accredited centre will apply with respect to staff, organisation and equipment , to guarantee standards of performing and reporting examinations, even when focused studies are being performed. Thus, even when performing a TOE on a sedated, intubated and ventilated patient, the operator should not be responsible for anaesthesia, the airway or the haemodynamics of the patient [40, 63]. This is particularly relevant in the haemodynamically unstable patient, and/or where more advanced studies (i.e. pacing optimisation/stress echocardiography) are performed. Critical care is delivered on the principle of respect for patients' dignity and cultural backgrounds. Invasive procedures should be fully explained to the patient and undertaken only after consent is obtained. An example of such a procedure is TEE. Exceptions are usually allowed in the case of life threatening emergency and/or where the patient is unable to give informed consent, but this may vary between countries. Where a patient is able to give consent, development of procedure specific consent (PSC) and patient/relative information leaflets (particularly for TEE) may be useful. Where possible, consent should be obtained before images are used by the practitioner for training other practitioners in accordance with local guidelines. Where research is undertaken, ethical approval must be obtained, and consent (for acquisition and use of both TTE and TEE images) sought according to the research protocol agreed and local guidelines. The permanent recording of images, where appropriate, is essential for the purposes of correlative imaging, future comparison and audit. A study should be performed and stored on video/digital format to be available for review and comparison. Digital storage is preferred, as it more easily facilitates serial comparison of studies which is invaluable in the management of the critically ill .
A system for recording the results of any echocardiographic examination in the patients' record is mandatory . Content of written reports should be as far as possible standardized to improve clarity and encourage proper nomenclature and should include important haemodynamic data and the level of cardiorespiratory support at the time of the examination. Responsibility for generating a timely report is shared between the trainee and his/her supervisors. A system for reviewing echocardiographic examinations and their reports within the ICU and in conjunction with the echocardiography department of the hospital is important. Regular audit of the number, quality of studies and their reports should be performed. Responsibility for continuous quality improvement is shared between the trainee and his/her supervisors. An expectation of level 2 and 3 practice is the performance of research in ICU echocardiography. As with all research in the ICU setting, obtaining consent to participate in research is challenging. Whether undertaking research using TTE or TEE, ethical approval and consent must be obtained according to local and/or national guidelines. To a large extent, intensive care has developed in parallel, but separate from cardiology, with little use of the range of physiological measurements and assessments that echocardiography has to offer. This is unsurprising, given the different training pathways that have been followed by intensivists and cardiologists. Indeed, echocardiography has been regarded as the province of the cardiologist since its inception nearly 50 years ago. With increased sub-specialization in the cardiological field, and the development of acute cardiac care as a specific sub-specialty, it is likely that some cardiologists of the future will extend their role into the cardiac ICU setting. The intensivist is, however, uniquely positioned to understand and balance the multi-system pathophysiological variables that underpin critical illness – both in the cardiac and general ICU setting. It is entirely appropriate therefore that intensivists should be able to develop echocardiographic skills, but consequently it is crucial that they should be able to obtain the necessary echocardiographic training such that they are able to practice this physiological investigation to a high level within their intensive care units. Not all intensivists will wish to (or need to) obtain this higher level training in echocardiography, however, every intensivist undergoing training should be competent in peri-resuscitation echocardiography. Where intensivists do wish to develop their echocardiographic skills, their goal should be a recognised accreditation through an established national or international body. This is achievable through collaboration between the existing accrediting authorities and the relevant national and international intensive care socieities – in a manner analogous to that in which TEE accreditation for anaesthetists was developed. The process by which training is obtained remains a challenge, however, the combination of practical training under supervision with interactive on-line learning will facilitate this process where there is no opportunity for an ICU echocardiography fellowship. 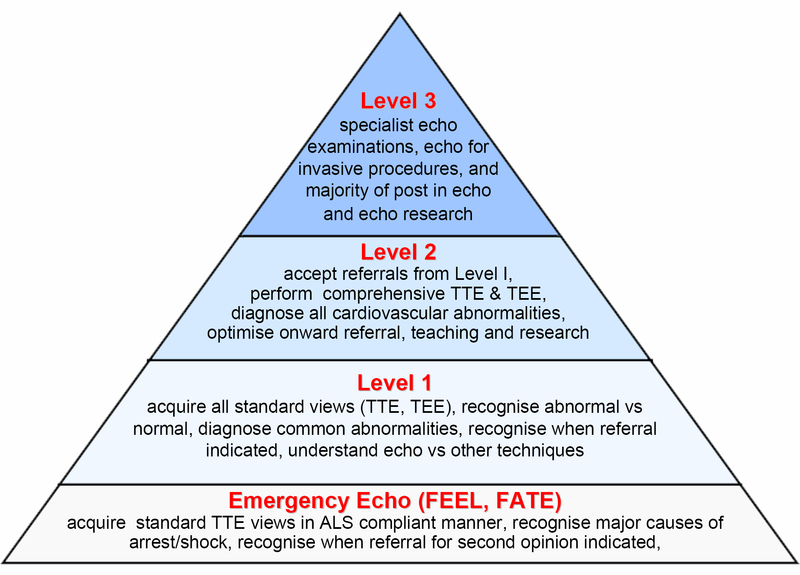 As with TEE training for cardiac anaesthetists, it is important that this accreditation should be regarded as an entry level requirement for those who wish to develop echocardiographic skills relevant to the ICU setting. ICU echocardiography should not be practiced in isolation, but in conjunction with consultant (echo)cardiologists as part of a comprehensive echocardiography service. In this way, one would hope to see the performance of high quality, relevant echocardiography, together with well-devised and executed research in this rapidly expanding field. This basic theoretical training is a prerequisite to any practical training in echocardiography. The minimum dataset required for completion of a comprehensive TTE study is shown below. In all cases, recording of patient demographics is mandatory. Unless peri-resuscitation, and ECG recording is not readily available, this should always be applied. Where focused echocardiography is used, only part of the "minimum dataset" for a comprehensive exam is required, and this is described in detail in Appendix 5. Where TTE images are non-diagnostic, TOE may be indicated (see Appendix 3). • Continuous wave Doppler across the tricuspid valve. Note peak velocity. • TDI (M-mode where views sub-optimal) of annular motion in the apical 4-chamber view. Basal free wall, septal, and RV. Table 2 [see additional file 1] is an outline for a full, comprehensive TTE study, including the Minimum Dataset, with the inclusion of additional views and measurements. The table summarizes the minimum and additional data comprising the standard adult TTE study by view, modality, structure, measurements, and derived calculations. As described above, where focused echocardiography is required, appropriate sections of the "minimum dataset" should be performed, and the nature of the study clearly recorded in the patient record. The minimum dataset required for completion of a comprehensive TEE study is shown below. In all cases, recording of patient demographics is mandatory. Unless peri-resuscitation, and ECG recording is not readily available, this should always be applied. Where focused echocardiography is used, only part of the "minimum dataset" for a comprehensive exam is required, and this is described in detail in Appendix 5. Table 3 [see additional file 2] describes the minimum dataset and additional data comprising the standard adult TEE study by, view, modality, structure, measurements, and derived calculations. As described above, where focused echocardiography is required, appropriate sections of the "minimum dataset" should be performed, and the nature of the study clearly recorded in the patient record. Although training in ICU echocardiography is divided into levels of competence, as already described [Additional file 3] clear demarcation between the levels is not absolute, and the practicalities of obtaining training in echocardiography provide specific challenges to both the trainee and their supervisor. Where echocardiography fellowships of appropriate focus and duration are not available, WINFOCUS suggests a supervised modular approach to obtaining echocardiographic skills, comprising emergency, introductory, and intermediate stages. On completion of all modules, it would be anticipated that the practitioner would have performed the number of studies and achieved the competency to undertake a recognised accreditation examination [Additional file 3] through a national/international accrediting body. An outline of the modular structure is described [Additional file 4], followed by a description of training requirements at each level. The modules are described in detail in Appendix 5. Where a study performed is focused, rather than comprehensive, this should be stated in the report. The specific details regarding the basic echocardiographic modules for focused assessment in each of these clinical scenarios are addressed in Appendix 5. • A minimum number of examinations should be undertaken – 50–100 is deemed as appropriate number of examinations required for a trainee to become competent. However different trainees will acquire the necessary skills at different rates and the end point of the training programme should be judged by an assessment of competencies. The critical care echocardiographer must take great care in the interpretation of ventricular function. It must be taken in the context of the clinical status of the patient, and the level and degree of inotropic support. Hence, the normal range values that apply in the outpatient setting may not be relevant to the ICU. Other conditions can cause systolic ventricular dysfunction, without necessarily causing myocardial damage i.e. excessively increased afterload to the right ventricle resulting in decreased systolic performance. When assessing ventricular function, each ventricle should be considered alone, and also in conjunction with the other ventricle. Standard assessment is with 2D detection of regional wall motion abnormalities, however, these occur relatively late in the ischemic cascade. Of relevance to the ICU setting, where TTE is used to detect regional wall motion abnormalities, echocardiographic contrast agents improve endocardial border definition and hence diagnostic sensitivity, however, their use may be precluded in the critically ill. There is much debate in the literature regarding the definition of diastolic dysfunction; however, for the purposes of ICU echocardiography, this should be taken to mean abnormalities of ventricular filling that may be independent of systolic dysfunction[76, 77]. As a primary reason for ICU admission, diastolic heart disease is extremely rare, however, the finding of abnormalities of diastolic filling patterns in the critically ill is not unusual, and the diagnosis has relevance to the haemodynamic management of such patients. Abnormalities in LV filling may occur in many conditions seen in the ICU, including aortic stenosis, hypertension, tamponade, pulmonary embolism, and severe LV systolic dysfunction. Any interpretation of LV filling patterns must therefore be made in the context of the full echocardiographic study. Inadequate circulating volume is a common feature of many of the syndromes encountered in ICU and optimization of volume status is crucial and often challenging [80, 81]. The decision regarding "volume status" and fluid challenges is perhaps the most frequent decision required in ICU and the correct answer depends on accurate prediction of preload-responsiveness (or volume-responsiveness, VR) . Here, echocardiography may be useful. Echocardiography enables assessment of the patient's volume status which is complementary to, and may be more reliable than measurements performed by traditional invasive hemodynamic monitoring [83–85]. In the ICU, when images are sub-optimal, TEE may allow for a more accurate assessment of intracardiac flows, heart-lung interactions, and superior vena cava distensibility than TTE, however, the information available from TTE often is adequate. Echocardiographic volume status assessment is based on static findings (single-measure dimensions and flows) and dynamic indices targeted to VR determination (variation in flows and dimensions after dynamic maneuvers: spontaneous or mechanical respiratory loading, passive leg raising, and/or fluid challenge). • Non echocardiographic VR heart-lung interaction-based indices (such as Pulse Pressure variations) may present false positives (especially in severe RV failure) which can be easily detected by echocardiography. In spontaneous/assisted ventilation, or in case of rhythm other than sinus, passive leg raising can be used as an endogenous fluid challenge to assess VR : an increase in LVOT peak flow > 12% has been shown to predict VR [88, 89]. Note: raised pericardial pressure and/or pleural pressure may lead to physiological "underfilling" of the ventricle(s) demonstrated using echocardiography, even when pressures measured by standard invasive means are increased. In assessment of filling, it is the trans-myocardial pressures that matter, not the absolute values measured. Most inflammatory conditions affect both layers, and may be associated with the accumulation of fluid in the pericardial space, in addition to the development of pericardial constriction. • The presence of classical echocardiographic changes depend upon a global collection with equal transmission of increased intrapericardial pressures. Under certain circumstances (i.e. post-cardiac surgery with localized collections, or right ventricular hypertrophy with a non-compliant, hypertrophied RV ), these changes may not be seen. • Following cardiac surgery, not only are these features often absent  but collections are small and easily missed using TTE. Here, if time permits, a TEE should be performed to determine the presence of a collection, and this, together with clinical features of hemodynamics compromise (or oliguria) is sufficient to make the diagnosis. • Tamponade can also occur in the absence of a pericardial collection, such as with large pleural effusions . Characteristic echo findings include thickened pericardium, preservation of ventricular long-axis function (TDI), marked respiratory variation in trans-valvular Doppler velocities, and dominant × descent on SVC/IVC venous filling . Where a patient is operated for pericardial constriction, post-operative echocardiography often reveals underlying restrictive ventricular disease. Echocardiography can play a key role in the management of the septic ICU patient both by excluding cardiac causes for sepsis, and by guiding haemodynamic management of those patients in whom sepsis reaches such a severity to jeopardize cardiovascular function and survival. Sepsis and septic shock (SS) are the most common causes of ICU mortality [112, 113]. SS is one of the most complex hemodynamic failure syndromes, and may imply derangement of all of the three mainstays of cardiovascular homeostasis, each one to a variable degree: absolute or relative reduction in central blood volume, severe peripheral vasodilatation, and RV/LV myocardial failure [114, 115]. Even if echocardiography is not available as a continuous monitoring tool, repeated bedside assessment at each hemodynamic deterioration or significant therapeutic intervention is advisable , allowing for prompt recognition and correction of the causes of cardiovascular instability [116, 117]. Echocardiographic findings should be integrated with clinical data and other monitoring information, especially with those concerning the adequacy of peripheral tissue perfusion. TEE enables for a complete assessment, also detailing heart-lung interactions and fine volume responsiveness evaluation. TTE, where adequate transthoracic views can be achieved usually provides adequate information, allowing for less invasive and more readily repeatable assessment, especially once key hemodynamic features have already been demonstrated. A state that can be easily and thoroughly assessed (section 5.2). Echocardiographic assessment of a patient in the initial phase of SS will generally reveal hypovolemia with hyperkinetic biventricular systolic function, unless underlying chronic cardiac dysfunction, other sepsis-triggered cardiac derangements co-exist, or aggressive mechanical ventilation (hindering RV function in the context of ARDS/pneumonia) is used. Where the shock state is volume-resuscitated, echocardiography can be used to determine VR (section 5.2). Sepsis-related LV systolic dysfunction is a well-recognized phenomenon. Both global and regional systolic wall motion abnormalities can be found [120, 121], and a hypokinetic state (low cardiac index associated with reduced EF) described in up to 60% of SS patients. There is no LV "adaptation" to this systolic function reduction by an increase in chamber dimension. Therefore, no significant LV dilatation is to be expected in a previously healthy septic-depressed LV[123, 124]. Sequential determinations of LV function (section 5.1.1) may allow assessment of LV recovery in survivors[12, 125]. RV systolic dysfunction may develop in up to one third of patients with SS, either in isolation, or associated with LV dysfunction[124–126] Intrinsic depression of RV myocardial function is detected as RV hypokinesia (see section 5.1.1), and semi-quantitatively appreciated as variable degree of RV dilatation (with RVEDA/LVEDA ratio measurement). When RV afterload is increased (due to ARDS, mechanical ventilation or pharmacological agents) on the background of an already impaired RV or not, acute cor pulmonale can be diagnosed using echocardiography [127, 128]. • Persistence of hypotension despite adequate preload and preserved (or pharmacologically normalized) biventricular systolic function. • Where ventricular dysfunction is found in a patient with SS, an ECG may help to distinguish between acute coronary syndrome-determined dysfunction (triggered by sepsis) from true sepsis-related myocardial dysfunction. Cardiac troponins may not . • LV dysfunction can be masked by sepsis-associated vasodilatation and preload inadequacy: always reassess LV function after preload and afterload optimization. • Assessment of LV (and RV) systolic function should be performed after correction of hypovolemia. • Extreme tachycardia (or tachyarrhythmia) can make volume status and bi-ventricular function difficult to assess. Here, assessment of the vena cavae may be helpful. Re-assessment after sinus rhythm/acceptable heart rate restoration will give more reliable estimate of myocardial dysfunction, if present, and outline a different volume status situation. Infective endocarditis (IE) is a microbial infection of intracardiac structures facing the blood. It can be encountered in ICU patients both as cause of admission or as acquired infection leading to a septic state with no evident focus. The diagnosis of IE is defined on the basis of a well established set of diagnostic criteria of which echocardiography is one of the major [131, 132]. IE is a severe disease with a high mortality, ranging from 20 to 25% and up to 45% in patients then admitted to ICU[133, 134]. Echocardiography contributes to IE diagnosis, allowing for assessment of severity, and has a pivotal role in management and decision making . • TEE has greater sensitivity for detection small vegetations and on mitral valve IE than TTE. Both techniques reach high specificity in equal manner. • The clinical context influences the diagnostic capability of TTE and TEE: while with low IE pre-test probability a negative good-quality TTE can exclude the diagnosis, TEE should be performed on all TTE negative cases with a high index of clinical suspicion. In mechanical ventilated ICU patients TEE is almost invariably needed . • TEE is mandatory in the assessment of suspected prosthetic valves IE, and in TTE positive cases to identify major valvular complications and guide surgical planning . This is uncommon – probably due to the lack of the hemodynamic factors usually associate with the pathogenesis of IE (flow turbulence, high pressure gradients) , however, the incidence is increasing with increasing patient intervention. In the ICU, the diagnosis should be considered in septic patients with no other clear infective focus, particularly if evidence of septic pulmonary embolism exists . Besides searching for vegetations on any catheter, from superior vena cava to its implantation on the myocardium, the examination (TTE and TEE) should focus on the search of infection on the right-sided heart valves [139, 141–143]. Septic thrombus on temporary central venous catheters in ICU patients and right heart endocarditis following pulmonary heart catheterization have also been described. Finding of masses on central venous catheters should prompt to consider non-septic thrombosis as differential diagnosis. All indices of LV/RV systolic and diastolic function currently used in clinical practice are heavily load dependent: findings must always be interpreted in the context of drugs/situations affecting afterload (vasodilators, anesthetics, sedatives, vasoplegia, effects of airway pressure on pulmonary circulation) (see sections 5.1, 5.12.1 and 5.12.3) and in the context of actual preload and filling status (see sections 5.2 and 5.12.2), also by integrating echocardiographic data with invasive monitoring, when available. In addition, transthoracic lung ultrasound may be helpful, but is beyond the scope of his document. Where the LAP is high and venae cavae suggest adequate filling, in the absence of any relevant cardiac pathology, simple volume overload may be diagnosed. Acute cor pulmonale is a life threatening condition characterized by a sudden severe increase of right ventricular afterload, determining a hindrance to RV ejection. Major causes of acute cor pulmonale are represented in ICU by acute pulmonary embolism and mechanical ventilation during ARDS. • Gradation of RV dilatation by ventricular diastolic area ratio may be misleading in patients with coexisting dilated cardiomyopathy. Where radiographic appearances suggest acute pulmonary edema, demonstration of normal left-sided filling pressures may suggest the diagnosis of ARDS/ALI . Of note, however, the two conditions may co-exist. Where the cardiogenic component is dynamic (see above) the diagnosis is particularly challenging, and targeted echocardiographic examinations performed in conjunction with standard hemodynamic monitoring may be indicated. • TEE may be useful in visualising the first few centimetres of the coronary arteries (particularly post-aortic root surgery) and identifying high velocities associated with restriction of coronary flow. Suspect acute mitral regurgitation (MR) post-AMI with hemodynamics compromise, pulmonary edema and pan-systolic murmur. The etiology of acute MR is readily detected using TTE +/- TEE and may be due to papillary muscle rupture, or LV dysfunction resulting in MV dysfunction. Where appropriate urgent surgical referral is indicated. • Grading the severity of MR: account must be taken of the pre-load and after-load, and if necessary loading and inotropic conditions altered. • In severe MR the characteristic regurgitant jet recorded on continuous-wave (CW) Doppler may be short and of low velocity (< 3 m/s), and in the most severe cases may not be visualized using colour flow. Here, PW Doppler (showing laminar flow) or ventricular angiography may be necessary. • Ischemic MR is a recognized cause of failure to wean from ventilatory support in the ICU. Where suspected, a targeted echocardiographic study performed when the patient is clinically compromised is indicated. If not possible, stress echocardiography (using Dobutamine, +/- volume loading and pressor agents) may be necessary. This is a relatively uncommon complication following the introduction of effective and prompt thrombolysis and/or percutaneous coronary intervention . As with acute, severe MR, ventricular septal rupture (VSD) should be suspected post-AMI where patients present with hemodynamic compromise, pulmonary edema and a pan-systolic murmur. The pericardial space should be imaged as described in section 5.3. A small amount of fluid in the pericardial space is not uncommon following a trans-mural AMI, and rarely causes hemodynamic compromise. Rupture of the free wall of the left ventricle may occur (rarely since introduction of thrombolysis) and will result in a very rapidly accumulating collection in the pericardial space – and is almost invariably fatal. Echocardiography either TTE or TEE may be performed in the emergency room department to assess the effects of blunt and penetrating chest trauma. The range of findings and echocardiographic indications are beyond the scope of this paper, which focuses specifically on ICU echocardiography. Indications for emergency assessment are widely discussed[30, 61, 185] and the use of echocardiography in this setting is undisputed. • Hemopericardium – the hemodynamic consequences depend upon the site, rate and volume of collection [191, 192]. Small, rapidly accumulating collections may be hemodynamically very significant. Beware late tamponade. • Myocardial contusion – may see regional wall motion abnormalities, or global dysfunction. Either/both ventricles may be affected, being right ventricular free wall more frequently involved . Note, does not correlate with ECG changes or predict complications reliably (except when abnormalities seen in conjunction with ECG abnormalities). Echo here is more useful in monitoring where there is hemodynamic instability on the ICU following suspected myocardial contusion. Where concomitant pneumothorax exists, TTE may be unhelpful and TEE required, however, beware polytrauma – where there is esophageal, maxillofacial or cervical spine injury, TEE is contra-indicated and other imaging modalities should be used. In each case, a comprehensive study should be performed, with attention to both anatomical and physiological assessment. Finally, where the hemodynamic status changes, echocardiographic studies should be repeated if the diagnosis is unclear, and may be used to guide volume replacement (section 5.2). • Is the heart "normokinetic"? – is this appropriate for the clinical state of the patient? Is it in reality relatively hypokinetic? Where a diagnosis is suspected, a more detailed study (as discussed in the preceding sections) should be performed to confirm/refute and refine the diagnosis. This can be oriented by the dominant clinical feature : systemic venous congestion (start by focusing on the right side of the heart), pulmonary venous congestion (start by focusing on the left side of the heart) or no clinical orientating signs (keep a high suspicion for hypovolemia). Finally, in addition to guiding the medical/surgical management and suggesting ongoing referral, in some cases further echocardiographic studies may be used to guide specific therapeutic interventions, i.e. to guide pericardiocentesis (look for the presence of contrast in the pericardial fluid – if necessary introduce some agitated saline – and when used, the presence of a guide wire) . Other applications of ultrasound may be used to guide venous and arterial access, thoracentesis and paracentesis, however, detailed description of these techniques is outside the scope of this document which is concerned with echocardiography. Of note, and similar to the concept of stress-echocardiography, great importance has comparison of findings with a basal exam, to be done immediately before starting the weaning trial. Echocardiography is widely used for the hemodynamic assessment of valvular pathology – regurgitation or stenosis. Valve disease as a primary pathology leading to ICU admission is uncommon. When present, the diagnosis may be challenging to the echocardiographer as the cardiac output may be markedly reduced, or the patient hemodynamically unstable. This is particularly notable when stenosis is suspected in a low cardiac output state, as here, trans-valvular velocities may be low. Careful echocardiographic assessment of all four valves is essential in a comprehensive study, with interpretation of trans-valvular forward and regurgitant velocities being interpreted in the clinical context of the patient. More common is the use of echocardiography for interpretation of hemodynamics in a structurally normal heart. Here, values may be obtained (using TTE or TEE) to estimate left atrial pressure, pulmonary arterial pressure and cardiac output, and guide institution and monitoring of therapeutic interventions [9, 11]. It is important to remember that echocardiography cannot measure absolute pressures in any cardiac chamber, however. Disease of the tricuspid valve leading to ICU admission is extraordinarily rare. Pulmonary valve disease rarely is an indication for ICU admission – except following cardiac surgery. – mean pulmonary artery pressure estimated from peak pulmonary artery regurgitant velocity. – peak pulmonary artery systolic pressure from pulmonary acceleration time. The commonest cause of valve disease in the Western World is now previous valve replacement. Elsewhere, rheumatic valve disease is still prevalent. Left-sided valvular pathology as a cause of ICU admission is more common than right-sided pathology. • Where LV function is poor and CO low, the measured velocity and thus derived pressure drop across the aortic valve may be correspondingly small. Peak velocity below the valve should be measured by PW Doppler across the LVOT and across valve by CW Doppler. A four-fold step-up in velocity across the aortic valve to be indicative of severe AS. • ICU admission can be precipitated in patients with (known and unknown) severe congenital sub-aortic stenosis. • M-mode of the mitral valve demonstrates premature closure. Significant mitral stenosis (MS) may mimic ARDS, presenting with poor gas exchange and bilateral pulmonary infiltrates. The history will usually suggest the underlying diagnosis. Even in the ICU, echocardiographic findings are characteristic. A precipitant for acute deterioration may be the onset of atrial fibrillation. Where the patient is admitted to the ICU in extremis, emergent balloon valvotomy or valvuloplasty may be considered. As with aortic stenosis, sequential stenotic lesions and/or a low cardiac output may lead to an underestimation of severity. Here, the LV stroke volume is obtained by measuring the CSA of the LVOT multiplied by the trans-aortic VTI. The greatest error is in measuring the LVOT – and TEE views may well be necessary. • The ratio of the RV pre-ejection period to ejection time – increased with an increase in pulmonary artery diastolic pressure, pulmonary vascular resistance and mean pulmonary artery pressure Of note, all parameters that are derived from the Doppler curve correlate with afterload – but this does not necessarily correlate with vascular resistance (i.e. if mean PAP is high, and PCWP is elevated, RV afterload is high but vascular resistancemay be low). Echocardiography is not useful in the estimation of systemic vascular resistance, although esophageal Doppler (equivalent to measuring descending aortic flow using PW Doppler and 2D imaging of the aorta) is widely used as a monitoring device in the ICU to determine cardiac output and SVR. As with any measure of hemodynamics, numbers obtained should be interpreted in the clinical context, and sequential values are generally required. Prolonged insertion of the TEE probe solely to allow serial CO studies should not be considered routine, particularly where there are high right sided pressures, as gastric and esophageal pressure/heating trauma may occur. Here, the use of other means of cardiac output monitoring is probably more appropriate. If prolonged or repeated echocardiographic monitoring is required, where possible TTE should be employed to minimize esophageal trauma. Where this is not possible, minimization of the amount of US applied, together with careful probe manipulation (including leaving in a neutral position) is essential. The WINFOCUS ECHO-ICU Group is constituted by all the authors of the manuscript. DT as WINFOCUS ECHO-ICU Chair; GV as WINFOCUS ECHO-ICU Secretary; SP, ES, FG, RB, EC as WINFOCUS ECHO-ICU members. Their contribution in the manuscript conceivment and writing is as stated in the "Author's contribution section". With regard to the manuscript "Echocardiography practice, training and accreditation in the intensive care: strawman document for the World Interactive Network Focused on Critical Ultrasound (WINFOCUS)", the authors declare not to have any financial or non financial competing interest. SP conceived and wrote the substantial part of the manuscript and of the Appendices. GV gave a major contribution in writing manuscript and the Appendices. DT contributed to the Appendices and to manuscript revision. ES, RB, FG, EC all contributed to manuscript critical revision. All authors read and approved the final manuscript.